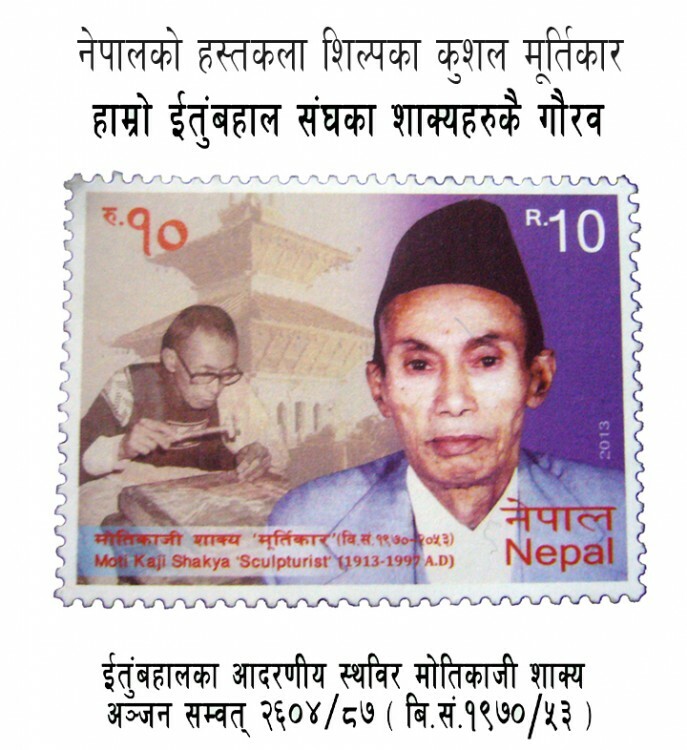 Post stamp Handicraft man sector sculptural artist of Itumbaha, Sthabir late Mr Moti Kaji Shakya was issued by government of Nepal on 23rd of Ashwin 2070. He was the famous artist of Nepalese Handicraft sector. Moti Kaji Shakya was born in Nara Devi Tole, Kathmandu Metropolitan City Ward Number 26 in the month of Kartik, 1970 B.S. His right hand was broken at the age of 12 or 13 when two fighting bulls trodden him down. And he became so much frustrated, as he could not do any heavy work with his broken hand. He started painting to pass the time. Later his uncle, who was well –known for carving on silver pots, encouraged him and taught him carving on metals. This is how he learnt sculpturing on the very age of fifteen. Later he started carving on silver, gold and other valuable metals as well. His artistic creations carved on silver, gold were so famous in Nepal, Darjeeling and Sikkim of India, Tibet, China and other countries too. The model of Rs. 1 and 50 Paisa coin having the face of King Tribhuvan was the creation of his skillful hand. On the different occasions, he carved very artistic Pashupatinath temple, Swayambhunath temple, Kasthamandap and other artistic idols of silver and gold on the honour of King, the Royal family, and the Royal Guests from the neighbouring countries. Though Moti Kaji Shakya had very simple and mostly informal schooling, he had very keen interest in self-study. He studied Buddhist literature and philosophy and he composed a few Buddhist vajan ( hymns) as well. He organized many Exhibitions for his own creations at National and International level. He received great honor and many medals for his carvings at different exhibitions and competitions. He died in 2053 B.S. at the age of 83.